For the last month, I’ve been trying out some items that I think would make fabulous gifts for mothers day and today I’m going to share them with you incase you are looking for a gift to buy your mum this year or for a female friends birthday. Mother’s Day is this Sunday, 30th March so its time to get shopping! I’ve also put together some ideas of ways to celebrate the occasion with your mum too. The first item I thought would make a lovely present is the Pandora Mother’s Day Limited Edition Sparkling Heart Bangle which Mr WLL actually surprised me with recently. He bought it from John Greed Jewellery, which is my favourite place to buy Pandora jewellery from, for £99 and it is available in 3 sizes- 17, 19 and 21 centimetres. The bangle itself is handcrafted from smooth polished sterling silver and it has a clasp that closes in the same way that the regular Pandora bracelets do, except that this one is a round ball with the Pandora logo on one side and a pink pave heart shape on the other. There is also one charm on the bangle which is a heart shaped pink pave charm which is like a full size, 3D version of the heart on the clasp of the bangle. I love the way that it sparkles and it makes a great layering piece. I have been wearing mine with my Pandora charm bracelet and my watch and it looks great for casual, everyday wear. Then I’ve been wearing it out on its own for evenings. Outing Idea: If you’re looking for something to do with your mum then I’d recommend going to a jewellery making class or ordering a jewellery making kit online which would be a fun idea to do together. I found this one online which is called Spoilt Rotten Beads but there’s so many others out there. 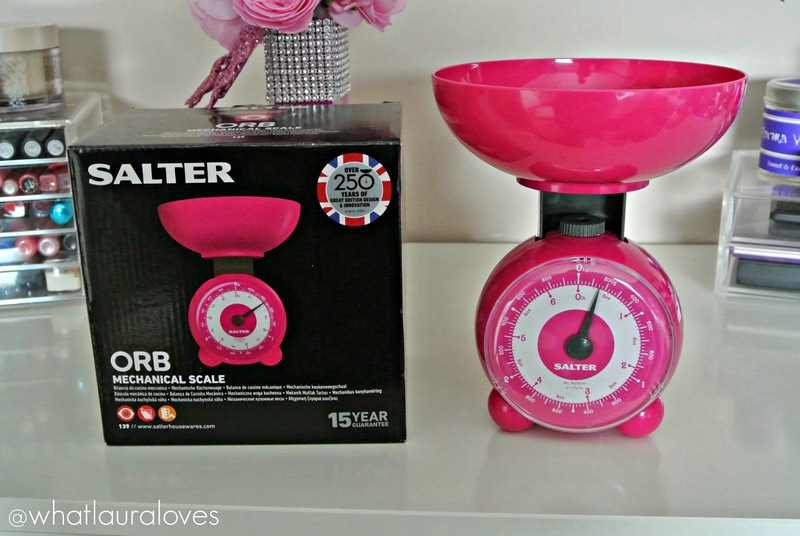 The second item that I thought would make a fabulous Mother’s Day gift is the Orb Mechanical Scale by Salter. This would be perfect for a mum who enjoys cooking and who is a little girlie as it is available in pink; although other snazzy colours are available too. I have been using these scales over the last month to weigh out my food before cooking it as I’m really focusing on portion size at the moment. The dial is very clear and easy to see what the weight reading is from a distance which is good if you’re trying to put a meal together quickly. The reading is very accurate as well, measuring in both grams and ounces and they are extremely straight forward to set up and easy to use too. What I like the most about them is that they’re very easy to clean and wipe down, plus the bowl is dishwasher safe, which I’m sure any busy mother would like as well! Whilst I do have quite a large kitchen in my home, I have SO much stuff in it that I struggle to find space for everything, especially as I like quite a minimalist look. The Salter Orb scales are incredibly space saving as they’re small and compact, making them easy to store in a cupboard or tucked away in the corner of a work top. These scales would make a great gift for a mother who enjoys cooking for the whole family or even for a grandmother who bakes with her grandchildren as they are very light weight and made of plastic, so heavy lifting down from a cupboard is not needed with these. 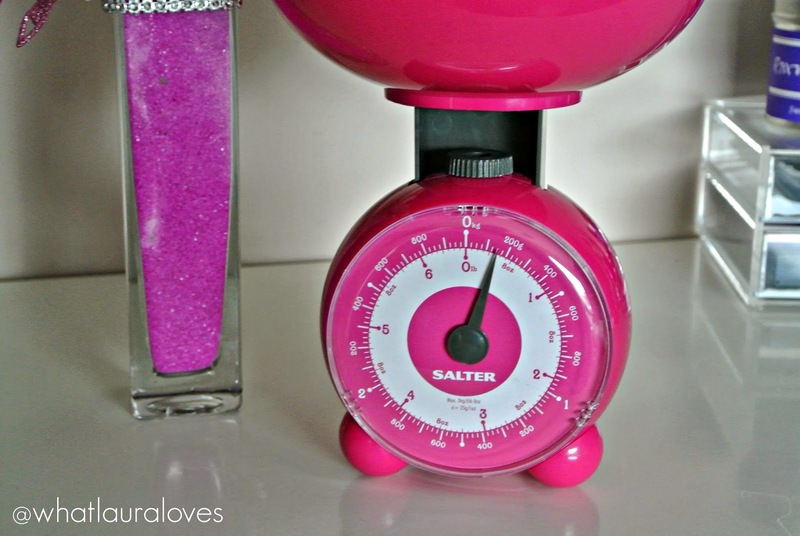 The Salter Orb Mechanical Scales are available direct from their website for £9.99. Remember Hugh Fearnley-Whittingstall from the River Cottage tv programme? Well you can actually visit River Cottage HQ for cookery classes which I think would make an amazing gift for a mum who loves cooking. There’s a great selection of courses available from meat and fish to baking. You can check them out here. Cooking classes in general are a great idea because you can go with your mum and do the class together. There are so many available and you can find them online very easily. Another website I’d recommend checking out is Red Letter Days where you can find a sushi making class for two for £60. 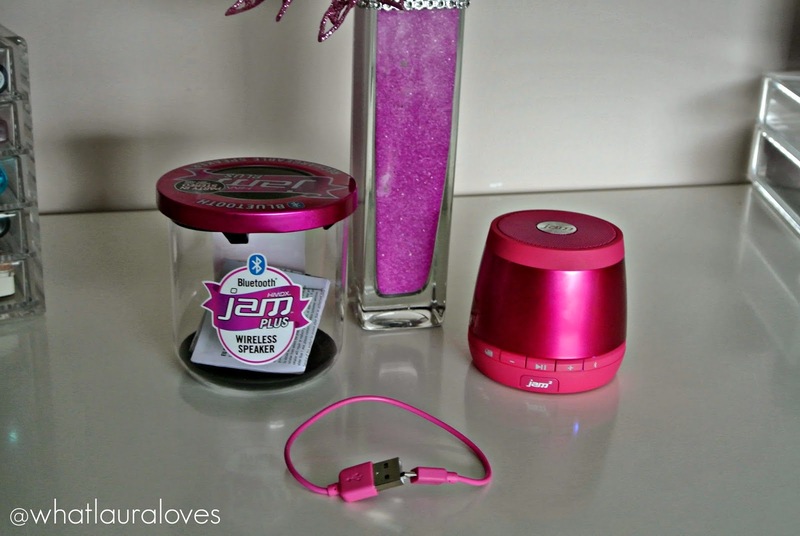 For a mum who likes to listen to music and who loves a party then I would highly recommend the HMDX Jam Plus Wireless Speaker which you can also get in the colour pink, as well as blue, black, silver and green. The packaging on this is absolutely brilliant for a start as it comes in like a little jam jar style pot with a twist off lid. It would probably be quite a chore to wrap so I’d suggest some pretty tissue paper and a gift bag for this one! The Jam is from the UKs number one portable speaker brand so you know you’re getting her something that’s high quality that will last. The speaker itself feels robust, I’ve had portable speakers before and they’ve felt really flimsy, this one doesn’t at all. She would be able to connect it to her smart phone, iPod, iPad, laptop or any other device using either the wire or through bluetooth to play her music or watch a film and if you get her two of them then they will play simultaneously in stereo. You might have seen my recent Instagram video showing this little baby in action… The RRP on this speaker is £59.99 however I have seen them on offer for £29.99 recently. You can buy them from Amazon, Tesco and HMV. If your mum is someone who likes music and to have a good time then I’d suggest a night out at the bingo with some drinks; this means that you can have a good natter over the bingo and then a dance afterwards. Many bingo halls are in town centres so there are places to go afterwards whether it be for dinner or a dance or two so they’re perfect for a night out. The Mecca Bingo in my city is fabulous because when you first sign up you get a booklet with money off so you can play on the slot machines and get some food while you’re there with your vouchers. My best friend and I won £90 on the Rainbow Riches game last time we went which then paid for our night out! You can also play bingo and games on their website. If you have a mum who is always on the go, as many are, then there is one product I’d definitely recommend for a spot of pampering. When your mum is running around, looking after you, she really needs to take some time to relax and pamper herself. The perfect gift would be a foot spa that your mum can use to pamper herself at home. The one that I have been trying out is the Elle Macpherson The Body Aromatherapy Foot Spa which is by a brand called HoMedics. I’ve used many foot spas over the years and this is by far the best one I’ve used because it is so complex but still very easy to use. 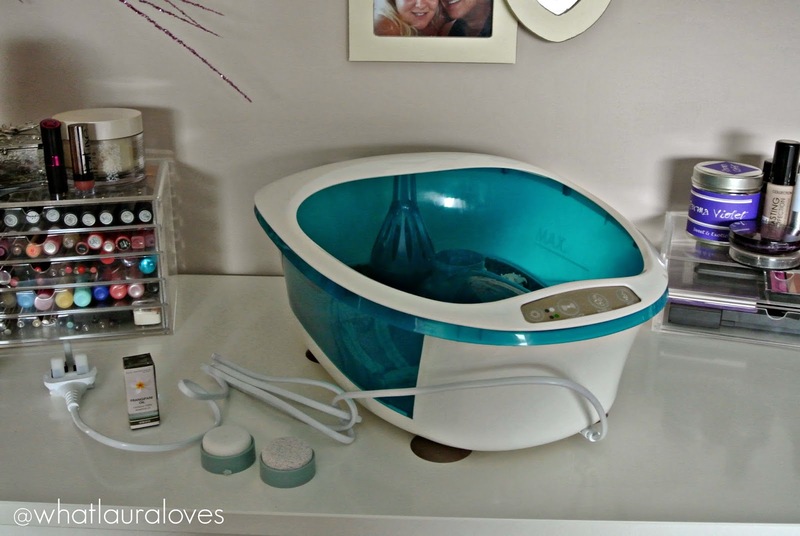 The one I was using before this was more or less a washing up bowl so when I started trying out this hydro massage foot spa complete with LED mood lighting, I felt very well pampered. It is a 5 in 1 invigorating foot spa that has double the bubbles compared to normal foot spas and whilst it doesn’t heat the water up, if you pour touchably hot water into it, there is a keep warm function that keeps the water warm and enables you to use the foot spa for longer than usual. 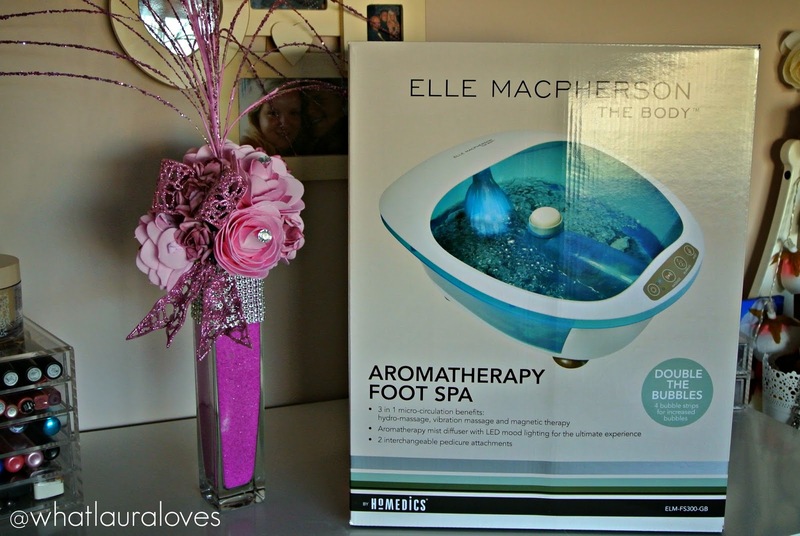 The foot spa features an aromatherapy mist diffuser and comes with a little bottle of aromatherapy oil to use with it. I have lots from Holland and Barrett that I sometimes use in my bath so I’ve really enjoyed trying out different ones with the foot spa. Mr WLL has even enjoyed using it after he’s been on his feet all day at work; I was a little sceptical at first but the foot spa fits feet up to a size 12 so he had no problems getting his tootsies in there. If you’re someone who needs to relax or if you have a mum who is always on her feet and in need of a chill out then this foot spa is perfect as it has acu-pressure nodes, 4 integrated massage rollers that feel a little tickley at first and a 3 in 1 micro-circulation boost in the form of hydro massage, vibration massage (which can be used wet or dry) and magnetic stimulation on your reflexology points. I’m actually preparing a pst that shows you how I use this foot spa to achieve a fab pedicure with the pedicure attachments to look out for that coming soon, just in time for the summer. 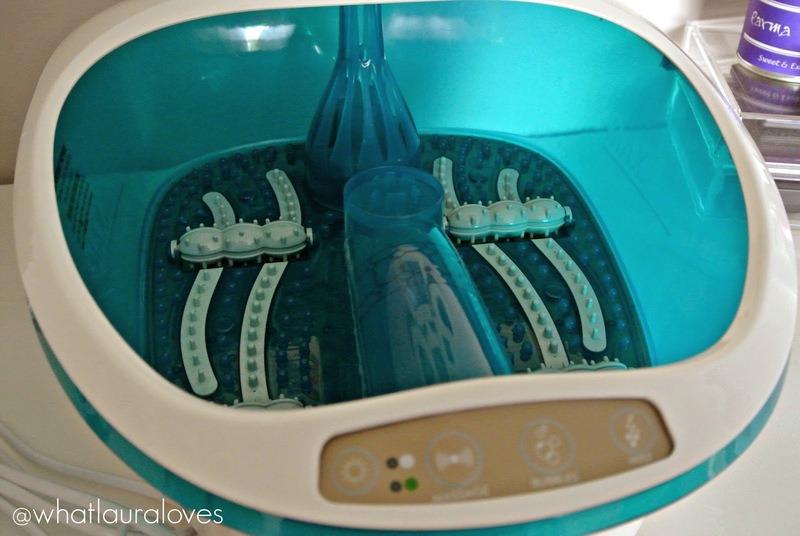 What I really love about this foot spa is how easy it is to use. It has an easy pour facility so you don’t have to worry about spilling water everywhere and the base is angled so that it wont tip over. Theres like suction cups on the bottom too so if you have a wooden floor then this is definitely not going to go anywhere! This foot spa really is the creme de la creme of foot spas and I would say that the original price point of £74.99 from Amazon is very well justified for the standard of product that you get. I’m sure you’ll be happy to hear that it is currently on sale on Amazon for £47.95. You can also pick this up for £45 from Asda and on Debenhams for £75. Another relaxing gift idea for a mum who perhaps isn’t into foot spas but still likes to relax is a candle or room spray. The candles and room mist that I have recently bought are by Lily Flame. 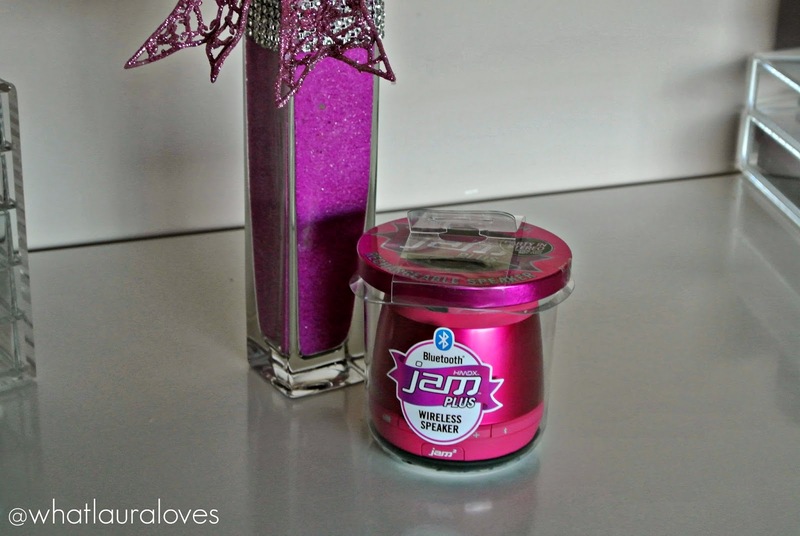 The products on the left are the Girly (pink) Mini Tins and they have three scented mini candles in them- Dolly Rocker, Blush (which smells exactly like Angel perfume) and Fairy Dust. 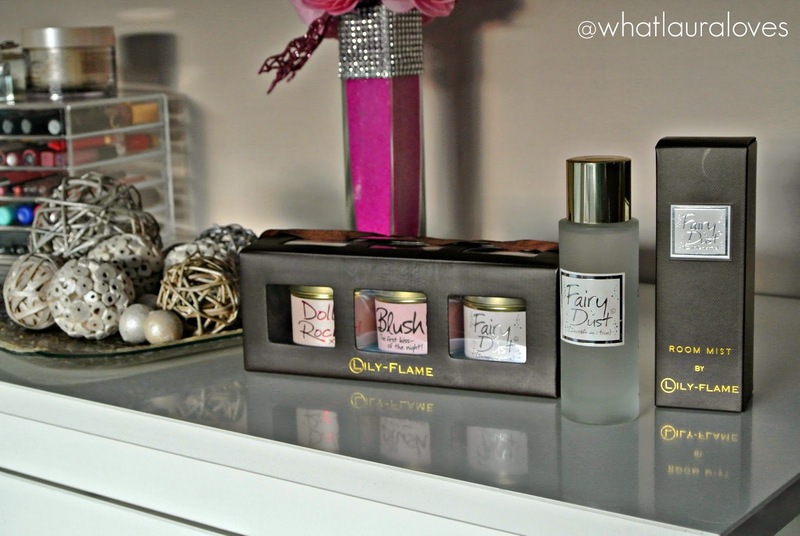 The other product is the Fairy Dust Room Mist which isn’t too over powering but smells gorgeous all the same. You can buy Lily Flame products here. The ultimate thing to do with your mum has to be a spa day. You can buy vouchers from Red Letter Days or you can buy one from your own salon locally. Either way, I think they’re the perfect way to chill out and relax with your mum.